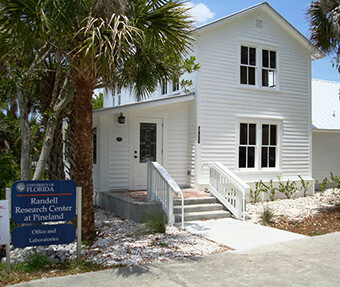 The Randell Research Center (RRC) is a program of the Florida Museum of Natural History, which has conducted research and education programs in Southwest Florida since 1983. The RRC has existed since 1996 when Donald and Patricia Randell gifted more than 53 acres of the Pineland archaeological site to the University of Florida Foundation. This property is now mostly state-owned. The RRC leases an additional 8½ acres from Lee County. The County property contains environmentally and archaeologically significant resources, as well as the Pineland Post Office and the RRC headquarters in the historic 1920s Ruby Gill House. An additional 5 acres was added in 2015, which has allowed the expansion of the Calusa Heritage Trail to include the Smith (burial) Mound, its surrounding canal, and the Low Mound. The Florida Museum of Natural History is located on the campus of the University of Florida in Gainesville. It was chartered in 1917 as the state’s official natural history museum and is fully accredited by the American Association of Museums. With more than 40 million specimens and artifacts in its permanent collections, the Florida Museum is the largest collections-based natural history museum in the southeastern United States. These collections are the foundation of the Museum’s scientific research and university teaching programs. The Museum also draws heavily upon its collections in meeting its public education mission through permanent and traveling exhibits as well as outreach programs, including the Randell Research Center, designed to inspire and educate the public about Florida’s natural history and rich cultural heritage. 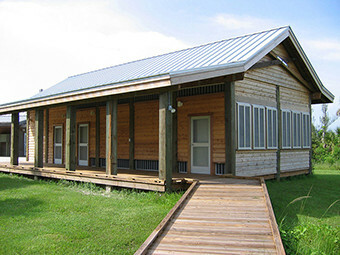 The Mission of the RRC is to maintain, at the internationally significant Pineland archaeological and historical site, a permanent facility dedicated to learning and teaching the archaeology, history, and ecology of Southwest Florida. The Pineland site complex is located in coastal Lee County, northwest of Fort Myers. The site was a Calusa Indian village for over 1,500 years. Enormous shell mounds still overlook the waters of Pine Island Sound. The remains of many centuries of Indian village life blanket the former pastures and citrus groves. Remnants of an ancient canal that reached across Pine Island sweep through the complex. Sand burial mounds stand in the woods. Historic structures representing Florida’s early pioneer history also still exist at Pineland. Native plants and animals characteristic of coastal hammocks, pinelands, wetlands, and shell mounds are in abundance. The site is listed in the National Register of Historic Places, and as a designated County Historical Resource. Pineland is important to archaeology and ecology for several reasons. First, its waterlogged deposits preserve artifacts not found in dry sites, including ancient botanical remains found nowhere else in North America. The remains of many centuries of Calusa daily life reveal a fascinating, complex world that existed before the arrival of Europeans. Second, Pineland provides a key to understanding larger, global issues. Its accumulated deposits hold information on sea-level fluctuations and climate changes of interest to scientists all over the world who study the earth’s environmental history. Third, it has proven to be an ideal location for teaching students and the general public about Florida’s environment and history. The Florida Museum of Natural History has undertaken archaeological and ecological field research at Pineland since 1988. The results have been published in both professional and lay-public forms. The RRC is more than just the Pineland site. It is a coordinated research, education, and publication effort that involves and serves southwest Florida at a broader scale. In the Gainesville office, Dr. William Marquardt directs the RRC’s programs and assumes overall responsibility for its performance. His Florida Museum faculty colleague, Dr. Karen Walker, who was research director during the intensive excavations at Pineland in the 1990s, edits RRC publications and directs her own program of research in southwest Florida, including the Everglades. Both Dr. Marquardt and Dr. Walker teach and serve on graduate student committees. The research in southwest Florida has resulted in two Ph.D. dissertations and seven M.A. theses under Dr. Marquardt’s supervision. An Advisory Board consisting of professionals and community leaders offers advice, helps raise funds, and assists in the operation of RRC programs though several active committees. At Pineland, Linda Heffner serves as our program assistant, Gary Vinson as our maintenance specialist, and Cindy Bear as our coordinator of programs and services. Through the Calusa Heritage Trail, the Pineland site is open daily to the public. Tours are also offered to the public, as well as special tours for schools and many other groups of all ages. The RRC works in cooperation with the Florida Public Archaeology Network regional center in Fort Myers, and is a founding member of the Trail of Florida’s Indian Heritage, a heritage tourism consortium for Florida. The motto of the Randell Research Center is “As We Learn, We Teach.” The RRC is committed to education at the broadest level, from elementary school children to University of Florida graduate students, from hands-on educational opportunities for local citizens to the Internet. During excavations at the Pineland site in 1990 and 1992, an ambitious complementary education program provided teacher training, classroom exercises, and hands-on environmental educational opportunities for over 5,000 school children and 600 teachers. Some of the children were from underprivileged backgrounds. We were astonished to learn that many of them had never seen the coast, in spite of living in a coastal county. For many – including a number of middle-class children – our archaeological walking tour was also their first close look at a woodpecker, a strangler-fig tree, or a fishing net. Thanks to an endowment grant from the Sear Family Foundation, the RRC is now able to offer educational site tours to several Title 1 schools each year. Title 1 schools are those with a significant number of families living below the poverty line. Learning about one’s surroundings and history is not just for children – the excitement extends to adults of all ages. Many newcomers are fascinated by Florida’s environment and history and are eager to learn about them. 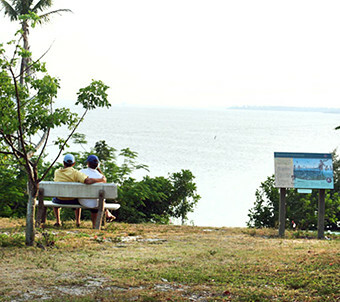 Thus, the RRC at Pineland has become a destination for “eco-tourists” and “heritage tourists,” offering exciting programs for the visitor who stays just a few days as well as meaningful activities (such as environmental monitoring and supervised archaeological excavations) for the longer-term visitor or part-year resident.